Place water, sugar and salt in a small saucepan. Heat and stir until sugar & salt are dissolved. Pour the warm water into a large glass jar. Add vinegar and the three spices (seeds). Add cucumber slices and onions in alternating layers. Note: Container sizes will vary. If your cuces & onions are not fully submerged just add more liquid to cover (half water/half vinegar). 31 Comments on "Easy Bread & Butter Pickles"
Do you have a new version of this for Bread & Butter Pickles with Probiotics…? I saw where you said you were going to put one up. Where can I find it…? Hi Jenny, you can find Persian cucumbers at most Korean markets. In fact, I just got some at my local Korean market at 3 pounds for 99 cents! I love bread and butter pickles, but I thought you should know that these have not probiotic effects. 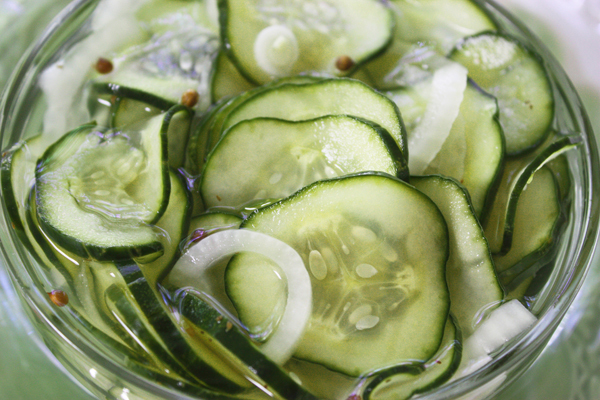 It is only fermented cucumbers that have probiotics. Cucumbers that have been pickled in salty water and fermented. They are low in calories and high in vitamin K. However, pickles made using vinegar do not have any probiotic effects. Oh no! Thank you so much for setting me straight. All these years I thought they had probiotics but I looked it up and learned something new today, thanks to you. I appreciate your taking time to write and I am removing that information from the recipe. I have been searching your recipe site for a couple of hours and find that you add sugar to many recipes where I wouldn’t expect it. I am diabetic and must account for all carbohydrates in my food. Just how important is this added sugar in your recipes? Jenny, you have a magic touch. I make a lot of your recipes. Each one is a gem. Your bread and butter pickles are simply out of this world. I make a new batch, the moment they are finished, which is every few days. There is nothing to beat a slice of your freshly baked bread, with thinly sliced feta cheese, & your incredible cucumbers. I took a chance that these would turn out great and doubled the recipe. It was difficult to wait 3 hours to try them but when I did, all I can say is I’ll never make pickles any other way and I’ve made a lot of pickles. They are crunchy with the perfect amount of sweet and tartness. I eat them straight out of the jar and put them on sandwiches. These pickles are the best and so are you for giving us so many easy and healthy recipes. Thanks Jenny. Can’t wait to try your dill pickle recipe. Hi Jenny–Greetings from Canada! I love your recipes. With your bread and butter pickles and your dill pickle recipes do you use pickling salt or table salt or does it matter? I would like to make these today. Jenny I have just discovered you on YouTube. I am really enjoying your videos and plan to make some of your no knead bread. I have made bread and butter pickles before. I was wondering if you knew how to make sweet gherkins which uses the whole cucumber when small. The ones in the grocery store are made with high fructose corn syrup and I wanted to cut that out of my diet. 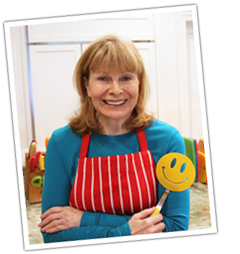 You have some great recipes, I added your blog to my blog reader too!! Hey jenny, I was wondering if you could use English cucumbers for this recipe. I’ve been making my bread & butter pickles with Persian cucumbers because I can’t find the Kirbies right now. They turn out great. How long can the pickles be refrigerated and still taste good? Just wondering how many batches to make now that cucumbers are in season here in the northeast. Thanks for your great recipes. I’ve enjoyed making so many of them and, of course, eating the fruits of labor. Some sources say they keep for up to 2 months but from my experience, homemade bread & butter pickles are best eaten within two weeks. I had some cucumbers from my garden to find a way to use and tried your recipe here. They are delicious and so easy to make . Love your cooking and recipes! Can I get the 3 hour dill pickle recipe? It is gone from your website. Thank you so much! You are great! I always wanted to know how to pickle! you made it very easy and fun. I have one question for a first timer. Would it be okay to add lemons and carrots to this mixer? I’m not sure since I’ve never done it but I think carrots, being hard vegetables, would never get picked in 3 hours. Not familiar with a “Kirby” cucumber? Is it the same as a regular cucumber? This recipe sounds delicious and easy. Love your video’s and recipe’s. Mine have never lasted more than a couple of weeks but I think they would keep for a month or two. My Mom made a pickle, like this dor as long as I can remember. I’m 80 and have made them my whole married life, and my children make them, now. These pickles, a sliced tomato and a piece of warm bread is the best meal in the world. Thanks for posting this so that others can have a “pickle party”! I agree. I love picking fresh tomatoes and cucumbers from the garden and eating them with any of the homemade breads on Jenny’s website – so yummy! I’ve made several jars of pickles already this year and will try this new pickle recipe.